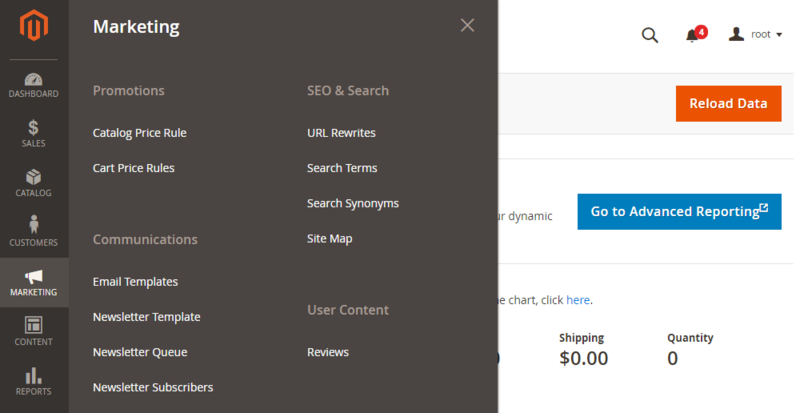 To configure the XML sitemap in Magento 2 please go to Marketing > Seo & Search > Site Map. Choose an existing sitemap to edit or if you don't have any XML sitemap yet press the Add Sitemap button. 1. Make sure that Magento 2 instance that uses DB2 has the same blog extension version as one that uses DB1. If not please upldate Magento 2 blog module on one of them. 2. Create a backup of magefan_blog_* tables in DB2. 3. Remove all magefan_blog_* tables from DB2. 5. Import dump to DB2. Using this instruction you'll easily migrate ALL blog data from DB1 to DB2. For database manipulations you can use phpMyAdmin, Adminer. 1. Download SDK version you need using the link https://github.com/facebook/php-graph-sdk/releases. In order to change the locale of Magento 2 Admin Panel, you need to click on your user icon in the upper right corner and go to Account Settings. Then, find in the Account Information section Interface Locale select box, where choose the language you need. If you need to translate some text in Magento 2 you can use the Magento Inline Translate functionality. In order to enable it, your Magento needs to be in the default or developer mode. Then you need to go to Admin Panel > Stores > Settings > Configuration > Advanced > Developer > Translate Inline. How to upgrade from Megnor Blog to Magefan Blog for Magento 2? Megnor Blog is a distribution of Magefan Blog. If you use Megnor Blog extension you might want to replace it with the latest version of Magefan Magento 2 blog extension to get new features, security improvements, and bug fixes. The changelog can be found on our website. 1. Make a full backup of your Magento 2 files and Data Base. 2. Rename all Data Base tables that start with 'megnor_blog_...' to 'magefan_blog_...'. E.g. rename "megnor_blog_post" table to "megefan_blog_post". You can use PhpMyAdmin for this purpose. 5. Install Magefan Blog Extension. 6. Recreate blog widgets. For homepage widget use custom template "Megefan_Blog::widget/list_home.phtml" in widget settings. In order to migrate AheadWorks Blog for Magento 1 to Magento 2 Blog please install free Magefan Blog Extention. Thereafter, please go to Admin Panel > Content > Blog > Import. If you have a product attribute and what to assign it to a single attribute set, it's easy to do via Magento 2 Admin Panel > Stores > Attributes > Attribute Set. But what if you need to assign it to all your attribute sets? What if you have 50+ or ever 100+ attribute sets? It can be time costly. So what you can do, is to create a simple script that will do all job for you. 1. Create a PHP file "myscript.php" in your Magento 2 root directory. In order to clean a cache in Magento 2 please go to Admin Panel > System > Cache Management. What you should know about reviews at mageplaza.com?